The trio of Alberto García was founded in mid-2015 in Basel, Switzerland. Our music come from tradition, a strong and fresh aesthetic vision, great musicianship and contemporary spiritual elements. The trio of Alberto García was founded in mid-2015 in Basel, Switzerland. In a spontaneous and almost involuntary way they began to play in the best stages of the city, even at the OffBeat Basel Jazz Festival (2016). Then moved to other Swiss and European stages. 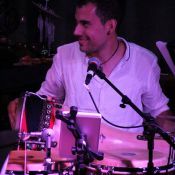 «Alberto García Trio» interprets an exciting combination of jazz harmony, folk melodies and rhythms from around the world with Afro-Latin influences. The music is accessible to all ears, the rhythmic-harmonic complexity is compensated with the simple and pleasant melodies which makes all audiences from experts to amateurs able to value and enjoy it. The trio have shared stages with musicians such as Raphael Rosse, Yumi Ito, Camela Sager and Oliver Pellet. At the moment they want to produce them first album, which need some help to pay the edition, mixing, mastering, CD pressing and design for physical CD. They are preparing next European tour and presentation of the new CD with many guests throughout Spain, France, Germany, Switzerland, etc. Our music is totally different! My project is special because we have a really special format, I don’t know any other «Jazz Trio» with trombone, bass and percussion with that much music influences. At the moment we have a real special way to play, I would say it can be our own style!!. This project ended successfully on 9/12/2017 13:00! You can download our new Album! As fast as we go it, we will send you our new Album! CD signed by the Trio! You will get a CD signed by the Band!! You will have the new album signed by the Band and you can join us in a General Rehearsal and if you are not in town you can watch it by Skype! CD + a percussion lesson! You will have our new álbum and a private lesson with Alberto García (45')!!! You will have our new álbum (x2) and a private lesson with Alberto García (60') and a photo with the band!!! You will have our new álbum (x3) and a private lesson with Alberto García, Pau Lligadas and Lou Lecauday (60') and a photo with the band!!! You will have our new álbum (x4), a private lesson with Alberto García(60'), a photo with the band and a free VIP ticket for our next concert!!! You will have our new álbum (x4) and a Private Acoustic Concert (40')!! Alberto was born in Las Palmas de Gran Canaria, Spain in 1990. He began studying all kind of percussions really early. Now he just finished his Master of Arts in Musikpädagogik und Jazz Percussion at the Hochschule für Musik Basel, with teachers like Jeff Ballard or Malcolm Braff. He has played with international people like Adrian Mears, Guillermo Klein, Wolfgang Muthspiel or Marc Turner.